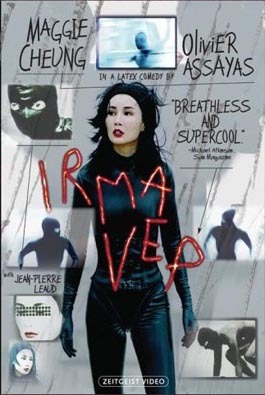 In Olivier Assayas' 1996 feature, Hong Kong cinema goddess Maggie Cheung plays a bungee celebrity (in and out of Paris in about 72 hours) hired to star as the cat burglar Irma Vep in a doomed remake of Louis Feuillade's sensational early film, the serial Les Vampires (1915–16). The project rests in the shaky hands of a depressed, dispirited moviemaker named René Vidal (Jean-Pierre Léaud); his sole moment of inspiration is the casting of Cheung, presumably because he saw her in The Heroic Trio. The one friendly member of this rancorous film crew is Zoé (Nathalie Richard), a frowsy but cute costume designer who falls for Maggie after seeing her in her clingy vinyl outfit. Meanwhile, Cheung is absorbed in her androgynous role, and in what is possibly a dream sequence, she even burglarizes a hotel room. By being a movie about a remake, Irma Vep shows the state of entropy into which French film had sunk in its efforts to outgame Hollywood. The bankruptcy of ideas and the reliance on action are represented by a journalist (Antoine Basler), who loves Hong Kong films and only Hong Kong films. Considering that Assayas' subject is the decline of a national art, Irma Vep is an optimistic, delicate movie that endorses that process of falling in love with a face you see onscreen. Cheung, stalking the corridors in a cat suit and mask, is a new icon of the mystery inherent in filmmaking and film watching. This welcome rerelease from Zeitgeist features an interview track with Assayas, some making-of footage, a short about Cheung and a booklet with additional material by Assayas about Feuillade.